PaGeneralAssembly is a Legacy Library. Legacy libraries are the personal libraries of famous readers, entered by LibraryThing members from the Legacy Libraries group. » Pennsylvania General Assembly's catalog. » Pennsylvania General Assembly's legacy profile. PaGeneralAssembly is also an author. About meThe Pennsylvania General Assembly was founded during the early colonial period. Today it is the legislative branch of the commonwealth of Pennsylvania's government. About my libraryThe Pennsylvania General Assembly Collection was the 422-volume library of Independence Hall in Philadelphia. Currently residing in the Rare Books Room of the State Library of Pennsylvania, the General Assembly Collection slipped out of history after its move from Philadelphia to Harrisburg in the early years of the 19th century. It was only in the 1960s that dedicated researchers from Independence National Historic Park and the State Library of Pennsylvania realized the historical value of this collection, and that all of the volumes were still together. 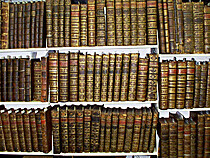 The first books in the collection, the 'Statutes at Large,' were purchased after the Assembly directed its clerk, Benjamin Franklin, in 1745 to buy some law books and maps for their use. Starting in 1752, the Assembly's Speaker, Isaac Norris II, worked to purchase further books for the collection. Norris and Franklin purchased the books from dealers in London. In following years, the books were boxed up and moved several times to protect them from war, and to follow the Assembly. Both General Assembly and its library moved to Harrisburg in 1812. The books in this virtually intact colonial-era library are the core of today's State Library of Pennsylvania. Much of the Assembly Collection was conserved during 2007-2008 at the Conservation Center for Art and Historic Artifacts (Philadelphia, PA) under a prestigious "Save America's Treasures" grant. "Save America's Treasures" is a public-private partnership between the National Park Service and the National Trust for Historic Preservation.